Why are aircraft noisy and what can be done about it? What generates noise on conventional aircraft? On approach, the airframe makes as much noise as the engine. 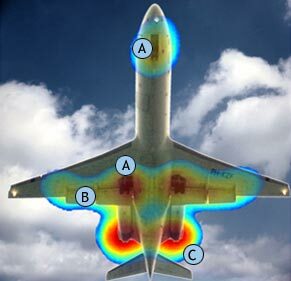 The flow over the flaps (labelled B below), slats and undercarriage (labelled A below) is unsteady and generates sound (Image showing the strength of the sound sources, courtesy of NLR). The jet noise contribution is labelled C.
What can we do about these noise sources? We will not achieve our noise target with engines hanging underneath wings - we need a greater integration of airframe and engine. For example, using the airframe to shield the engine noise from listeners on the ground. With engines underneath the wings, the sound tends to be reflected downwards. The noise made by engines above the wings is shielded from listeners on the ground. We can also use extensive acoustic liners in the inlet and exit engine ducts to absorb engine noise. All airframe noise sources are cut by reducing approach speed, and so there are benefits from flying the final approach more slowly. 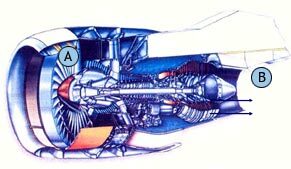 There are also benefits from reducing the engine fan speed and the jet velocity, since their noise increases significantly with speed.